Fusion Arts is a catalyst for creativity in Oxford, and beyond. Since 1977 we have connected artists with communities, and inspired hundreds of bespoke creative projects. Through the transformational power of the arts, we respond to challenging social circumstances by delivering meaningful and inclusive artistic experiences. Formerly known as Bloomin’ Arts, Fusion has been operating from our base on the corner of Princes St and the Cowley Road in the heart of the artistic East Oxford community since March 1977. Fusion’s projects reach across Oxfordshire and beyond, working within communities in public and environmental art, participatory art projects and high profile public events such as Cowley Road Carnival, WinterLight festival and In-tent-city – have you seen the bronze ingots on Cowley road? Well, that was a Fusion “Insite” project! View our [past community projects](/projects/archive). 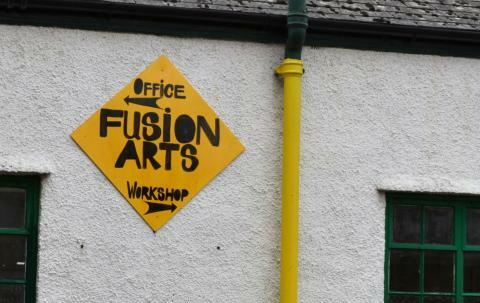 Our offices are based at Fusion Arts Centre where we also have two large workshop spaces, from which we deliver a thriving programme of arts activities for adults, children and special interest groups. Please see What’s On for current event listings and to pick a class that suits you. We also hire these spaces out to local arts professionals at a low cost rate, and are always happy to talk to you if you have ideas for classes, exhibitions and events. If you’d like to use our space for a special event or to set up a new class please see our hire page for more information. Our dedicated staff are constantly fundraising for new projects for continued work with diverse community groups. If you have any ideas for creative projects that we could help with and work in partnership with you on, then please get in touch! Fusion Arts gratefully acknowledges our core funders, Oxford City Council and all the various trusts and foundations that support our work, past and present: Arts Council National Lottery Project Grants, BBC Children in Need, Mr and Mrs Pye’s Charitable Settlement, The Tolkien Trust, Lankelly Chase Foundation, Youth Music, Heritage Lottery Fund, MINI Plant Oxford, Lloyds TSB, Awards For All, First Light, Oxfordshire County Council, West Oxfordshire District Council, South Oxfordshire District Council, Cherwell District Council, Oxford Brookes University, The Chill Out Fund, Oxfordshire Community Foundation, Youth Opportunities Fund, Local Network Fund, The Carnegie UK Trust, East Oxford Action, Emma’s Trust, The Henley Festival, vinvolved team, , Paul Hamlyn Foundation, The Ashmolean Museum of Art and Archaeology, Barrett Homes. We are also grateful to the support found through our many community partnerships. We also support artists in furthering their community arts skills. All our projects work towards reaching these goals.